You’d expect the Ryzen 7 1700X to sit firmly in the sweet spot of AMD’s 8-core/16-thread Ryzen 7 range, given that it’s around $130 cheaper than the flagship Ryzen 1800X, yet lacks little in terms of specifications. You get the same cache amounts, with 16MB L3 and a total of 4MB L2, plus the same 8-core and 16-thread configuration. The 95W TDP is the same too, which is 30W higher than the that of the 1700, while Extended Frequency Range (XFR) – AMD’s additional frequency bump above its Precision Boost technology, is supported by the 1700X too. The latter is AMD’s equivalent of Intel’s Turbo Boost, but XFR can provide an additional 100MHz on top of Precision Boost to two cores, depending on the CPU temperature, to aid in lightly threaded workloads. The Ryzen 7 1700X is also more potent out of the box than its cheaper sibling, the 1700, with a 400MHz advantage in base clock at 3.4GHz and a 100MHz advantage in turbo frequency at 3.8GHz. XFR also nets you up to an extra 100MHz on two cores, compared to just 50MHz on the 1700, so two of the 1700X’s cores can actually reach 3.9GHz. The main benefits of this CPU depend on whether you’re aiming to overclock it, as our review of the 1700 shows that you’re likely to reach similar overclocking limits with all the Ryzen 7 CPUs. If AMD is to be believed, you’ll stand more of a chance reaching 4GHz with the 1700X than with the 1700, though, even if our samples contradict that claim – the 1700X has supposedly been speed-binned to offer more overclocking headroom. Interestingly, XFR also seems to be more reliant on the Windows 10 power profile than cooling. Setting the profile to Balanced resulted in a higher XFR boost and better single-threaded performance, while enabling the High Performance Windows power profile saw performance rise a little in Cinebench at the cost of single-threaded performance. As AMD recommends using the latter profile with Ryzen CPUs, that’s the one we’ve used in our testing. The Ryzen 7 1700X performed as expected, sandwiched between the 1700 and 1800X, and usually performing closer to the latter. 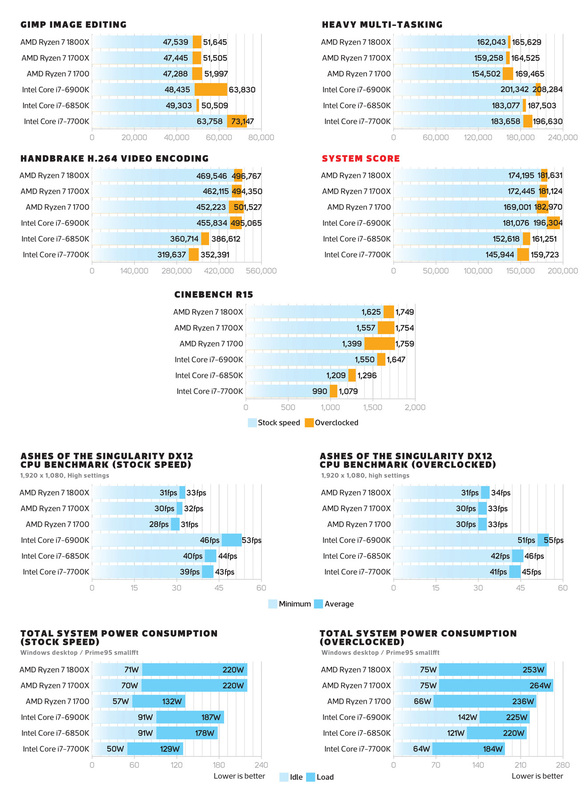 The RealBench system score of 172,445 was higher than that of the more expensive Core i7-6850K, thanks to a quicker result in our heavily multithreaded Handbrake video encoding test, although the Intel CPU was faster in our image editing and multi-tasking tests. Cinebench was a washout, though, with the 1700X even outperforming the Core i7-6900K, which costs nearly three times the price. Once again, though, games either showed no benefit from using a Ryzen CPU, or were slower, as in Ashes of the Singularity, while Deus Ex: Mankind Divided showed no difference. We managed to overclock the Ryzen 7 1700X to the same 4GHz frequency we achieved with the 1800X, but with a slightly higher vcore of 1.44V. This overclock saw it nearly match the Core i7-6900K in the video encoding test, which was overclocked to a higher frequency, and it beat the same CPU in Cinebench too. This boost was enough to eclipse the overclocked Core i7-6850K in the image editing test too, and it scored nearly 400 points more in Cinebench as well. Meanwhile, power consumption was lower than an LGA2011-v3 system at idle, but our 1700X test rig was a little more power-hungry once overclocked. 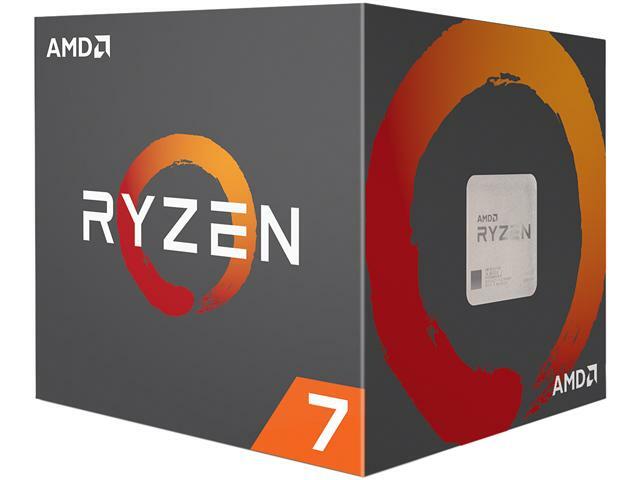 Despite its lower price compared with the Ryzen 7 1800X, the 1700X is still noticeably more expensive than the Ryzen 7 1700. If you’re ready for some overclocking then the Ryzen 7 1700 can usually overclock just as far as the 1700X. The Intel Core i7-7700K is also faster and cheaper in many tests, including some games, but as an out-of-the-box great multi-threaded performer, the Ryzen 7 1700X is a better option than the Core i7-7700K and Ryzen 7 1700, and it also performs close to the 1800X while undercutting it by $100. Great multi-threaded grunt at stock speeds, but the 1700 can run just as fast if you’re happy to overclock it.